Most homeowners would agree that the safety of their loved ones comes before house considerations such as aesthetics or even price. However, it'd be hard to find anyone who's pleased to find a new home's windows covered with unsightly burglar bars. A number of alternatives to this basic safety measure exist. If you're looking to improve your home's security without evoking all the appearance of a prison, consider burglar bar alternatives. 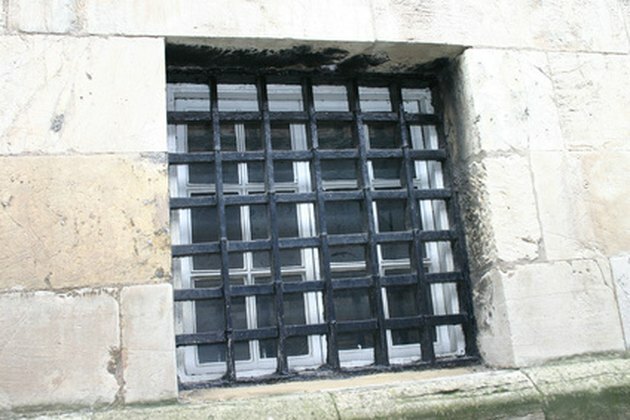 Burglar bars improve a home's security but may mar its aesthetics. If you live in a single-family home, install a high security fence around your property, extending the safe zone to include your yard or garden and leaving your windows free of bars. Incorporate the fence into your landscaping for a less austere look. If you opt for a relatively open fence design, such as wrought iron bars, plant high shrubs along the fence's perimeter for additional privacy. Avoid planting any shrubs directly outside windows or doors, as those may provide convenient cover for intruders. Before installing any fence, consult local building codes and ordinances. Municipal codes sometimes ban high fences along front yards or fences built of certain materials. If your property is on a corner lot, you may need to design your fencing so it doesn't extend to the extreme corner of your property. Some cities, such as East Chicago, Indiana, have ordinances requiring that fences do not prevent drivers or pedestrians from seeing intersecting roadways. A range of home security companies offer alarm systems that alert you or the police of the entrance of any unwelcome guests. Depending on your home's relative security risk, an alarm system might include motion detectors, video cameras, audible sirens or a direct calling feature to reach local law enforcement. Typically, with an alarm system, you enter a security code into either a keypad or an electronic touch-screen to arm and disarm the system. When armed, the system monitors all the entrances and may additionally detect the sound of breaking glass. Systems may include additional security monitors, incorporating advanced smoke or carbon monoxide detectors. Modern systems may include fingerprint or iris identification. The system should cover all entrance points, including basement windows that are low to the ground, the most common location for burglar bars. A good security company will consult with you on the specific safety profile for your home, including factors such as local crime rates, distance from other houses, property value, your pets and your daily schedule. If you enjoy animals and have the necessary time and energy, consider the adopting and training a guard dog. While this alternative will require a smaller initial investment than high-tech security systems, adopting a dog will require long-term food and medical expenses as well as demands on your lifestyle. Mother Earth News advises that the specific breed of dog matters less than its training to serve as a guard; a ferocious temperament is less important than a loud and responsive bark.